After continuing our journey with John Crichton last week with “Terra Firma” and “Twice Shy,” our Farscape re-watch continues this week with the fifteenth and sixteenth episodes of Season 4. 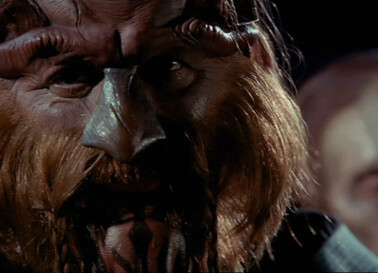 After the enjoyable but slight “Twice Shy,” Farscape goes back to doing what it does best with “Mental as Anything,” a dark character study episode of the type the show used to do more regularly in the second season that shines new light on one of Moya’s crew, which is particularly impressive here, given how well we know them all by this point. It’s been a long time since we had a story centered on D’Argo and even longer since we first learned of his tragic love story with Lo’laan and the real reason that he was imprisoned by the Peacekeepers, and what’s particularly fascinating about this episode is how it causes both D’Argo and us as viewers to revisit a time in his history that we thought we knew everything about and discover a new perspective on it that is more uncomfortable and troubling than we might have imagined but which also speaks a great deal about how far he has come since then. In some ways, “Mental as Anything” and the next episode, “Bringing Home the Beacon” are companion pieces, as well as a reflection of the “split-crew” episodes of Season 3 in microcosm, for besides a quick teaser set in Pilot’s den in which Aeryn appears, being very cozy and intimate with John (the last time this will happen for a while, making the scene a bit sad in retrospect; these poor kids have no idea what they’re in for…), the guys and gals temporarily go their separate ways here, Scorpius taking John, D’Argo, and Rygel to a mental training facility run by a fairly scary individual, ostensibly so they can discover information about the Skreeth that killed John’s friends on Earth but actually in order to teach John in particular how to withstand a mental attack from a Scarran, while Aeryn, Chiana, Sikozou, and Noranti have their own adventure, detailed the following week. But the heart of the episode isn’t actually the training but the person who D’Argo runs into at the facility, namely Macton, his ex-brother-in-law, the man who killed his own sister, D’Argo’s wife, Lo’laan, because he disapproved of their relationship, providing D’Argo with an opportunity to either give into his desire to kill him out of revenge or to prove himself the better man after all of these years. Things aren’t so simple as that, however, for, perhaps as a result of how deeply the training is causing him to submerge into his own mind, D’Argo begins to doubt his own memory. Could Macton have been telling the truth all along? Could D’Argo have killed Lo’laan in a fit of hyperrage, which can be accompanied by memory loss and blackouts? What might be most remarkable about the episode is how boldly it traverses such a delicate issue. It isn’t often in pop culture that we are given a story about a character we had always thought of as a heroic figure, as well as an often surprisingly gentle warrior, only to learn that he might have beaten his wife to death. As it turns out, this isn’t the case, after all. While Macton is able to fool D’Argo for a while, once he shows him his “memory” of Lo’laan committing suicide due to depression over the “constant” physical abuse, D’Argo knows he is lying to him, because he knows that she never would have willingly abandoned their son, Jothee. Which leads to the real truth coming out, which is that Macton had threatened to ruin D’Argo’s life, Lo’laan in response had raised a knife to him in order to stop him, and he had turned it on his sister, due to his military reflexes. After realizing what he had done–for which he was genuinely remorseful and horrified–he had viciously beaten her corpse in order to frame D’Argo–easily one of the most disturbing scenes in the show’s history, despite all of the grisly actions occurring out of frame. And so even with this, the situation already isn’t as simple as it had originally seemed. Rather than having fore-planned a murder in order to punish his sister for having married a Luxan, it was a crime of passion, and it’s even possible that on some level, Macton had been trying to protect her. Because, although the episode leaves it ambiguous to a degree, it seems that D’Argo had hit her on at least one occasion. 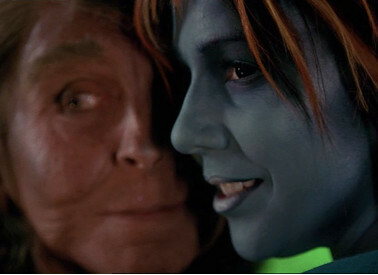 However, at the same time, unlike on most sci-fi shows, Farscape doesn’t use practically every alien occurence as an only vaguely camoflauged representaion of human behavior, and so while another show might have used this plot point as a metaphor for a physically abusive relationship by our standards–in other words, the hyperrage would have simply been a metaphor for either drunkenness, drug use, depression, or whatever compels human men to abuse their wives, which would make D’Argo fully culpable, the hyperrage a pathetic justification or excuse–this show has carefully established hyperrage in the past as an actual biological part of a male Luxan’s genetic make-up. In fact, we learn here that male Luxans are generally encouraged not to marry until they are older and have learned to exert better control over their hyperrage for the very reason that, in one of these fits, they could lash out at their wives in a blind rage without having any control over their actions or idea of what they did. By marrying so young as they did, both D’Argo and Lo’laan–not unlike Pilot becoming initially bonded to Moya before he was considered mature enough by his society–were taking a risk, and one they were fully aware of. And what becomes apparent to D’Argo from this experience is that Lo’laan had actually lied to him to protect him and their marriage. He had made her promise that, should he ever hurt her during a hyperrage fit, she would tell him and he would leave. She, however, kept it a secret from him due to her love for him, a truth that breaks his heart when he learns it now. He had always had an idealized view of their marriage. He had thought their love perfect and so strong that it was capable of overcoming his perhaps flawed, certainly complicated, biology, when in fact he had unwillingly laid hands on the woman he loved and she had lied to spare him this guilt. And so, again, this is an incredibly complex situation from many perspectives. On the one hand, D’Argo’s actions did indirectly lead to Lo’laan’s death, and he did hurt her (although clearly never a full-on beating, or she wouldn’t have been able to hide the effects, versus how Macton left her body). On the other, he had no control over himself and didn’t even know what he had done because she had protected him from it. He had even believed himself to have taken precautions to prevent it. Should he be held accountable for actions he didn’t willingly or even consciously take, nor was he even aware of until years later? Meanwhile, while Macton did claim to love his sister, his refusal to respect her wishes and her relationship mostly came from his Peackeeper racism against Luxans. And, again, in death, he did far worse harm to her than D’Argo ever did. Anthony Simcoe does marvelous work here, expertly charting the different stages of D’Argo’s reactions here, from anger to the horror at the possibility that the central truth that has defined his life for countless cycles had been wrong to the realization that he hadn’t killed his wife tinged with guilt over what he had done to her. I think it’s fairly safe to say that this is one of the most unique handlings of this sort of story that has ever been done. At the very least, it’s remarkably unusual dramatic waters for an actor to have to chart, and he does a stunning job. And in the end, what really shows that D’Argo, at his heart, is a good person is that he can feel this guilt and horror and yet, despite his more primitive biological urges, not allow them to destroy him. His years aboard Moya, his friendship with John–all of these things help grant him perspective and help him calm his rage. In the end, he chooses not to kill Macton but instead after his climactic mental bout with him, leaves him trapped in a coma, surrounded by his own nightmares over the hideous things he had done. Would it have been more merciful to just kill him? Perhaps, but by not ending his life with a simple act of violence, D’Argo shows that he is more than the brute Macton believes him to be. He defeats him not through physical strength but due to having a stronger will, as well as due to knowing his wife better than her brother ever did. Lo’laan’s faith in D’Argo was unshakeable, and that’s what he draws strength from here, seeming dedicated to moving forwards in finding and maintaining a better spiritual balance in her name, even if he’ll never fully forgive himself for his contribution to her sad end. You may notice I haven’t said much about the other characters, and that’s because their journeys aren’t nearly as interesting nor as well-done as D’Argo’s here. Rygel gets to defeat a Charid with his mind, which is pretty awesome, and John suffers through a torturous training that doesn’t really do much to further his character. He’s trapped in a horrendously hot cell, keys repeatedly thrown down at him but all too fast to grasp before they fall through the grated floor onto burning hot coals. And although one expects him to have to come up with a clever solution out of the problem, in the end, he picks up the red-hot grate with his bare hands, plunges them into the burning coals and lifts the sizzling key, scalding his hands all the while, which I guess is meant to be him succeeding over his fear of pain, and yet the lack of any cleverness seems unlike him. Some have also complained that he could have taken his shirt off and used it to wrap his hands, which is true, although I could also accept that by this point he was getting delirious from the heat. Which, to be fair, is why he ends up burning his hands at all, so perhaps it isn’t fair to expect him to think his way out of the situation, but it also doesn’t seem that he’s learned anything of actual applicable use here to withstanding the Scarrans. It’s not like he actually mastered the pain. He was in agony throughout the experience. And the experience also can’t really be compared to having one’s brain probed by waves of psychic heat. So, yeah…not sure exactly what they were going for with that thread. While the previous episode, the all-male “Mental as Anything” was a dark, brooding affair, the all-female episode (other than a very short scene in the teaser, as well as the final act), “Bringing Home the Beacon” that follows it is arguably Farscape’s final all-out romp. That isn’t to say that it’s a fully comedic episode, but that the bulk of the episode has a sense of bouncy fun unlike any you find in the series’ last set. That also isn’t to diminish the series’ breathtaking final run nor its remarkable entertainment value but to say that it can be dramatically heavy-going, what with John’s seemingly impossible quest to rescue Aeryn from captivity aboard a Scarran dreadnought, and this can be seen as the last burst of just pure fun before the big climax(es). At the same time, however, even this episode isn’t devoid of serious goings-on, for it actually involves secret, unsanctioned negotiations between Grayza and the Scarran War Minister Ahkna (yet another role taken on by Francesca Buller, Ben Browder’s very talented wife, whose intimidating presence here isn’t even vaguely reminiscent of her more obsequious previous characters, M’Lee, RoNA or Raxil) and culminates in a devastating reversal involving Aeryn. At the start of the episode, the women have come to a trading outpost located on the corpse of a dead Leviathan, the irony being that they are here in an attempt to save their Leviathan’s life, or to at least help protect her and them from the Peacekeepers and the Scarrans via a device that they can buy here capable of masking a ship’s signature for that of a variety of other options. And, of course, while they’re hanging around, waiting for their order to be completed, who should so happen to show up by both sets of people they’ve been trying to avoid: Grayza, Braca, and a small group of PKs, and Minister Ahkna and a few other Scarrans. Because Farscape. These people are safe nowhere. With this once-in-a-lifetime opportunity presented to them, Aeryn and Sikozou can’t pass up the ability to spy on Grayza and hopefully discover what she has really been up to all of this time, and Aeryn in particular hopes to finish it off by assassinating her and thereby eliminating the threat she has posed to John for the past year or so. And while she ends up not being able to line up a clear shot, they witness something very interesting and troubling: Grayza apparently has no problem betraying the PKs’ new alliance with the Luxans, as she willingly concedes their planets to the Scarrans as part of a new peace treaty, a peace treaty which Ahkna immediately betrays by having her guards assassinate all of the PKs in the room other than Grayza and Braca, then taking them both captive, the reason ironically being to extract the wormhole information that they and PK Command have lied about having in order to keep the Scarrans in line. This would, of course, be a problem for everyone, for once their mental interrogations are done, they would undoubtedly discover that the PKs have nothing. Even the dreadnought that the PKs have taken credit for destroying with a wormhole weapon was actually done by the other John Crichton, and so the galaxy could be well and truly frelled. In the meantime, however, the scenario provides a fantastic chance for all of the women to show off their skills, as well as to work together in a way we rarely see, since they’re so often at odds with each other due to their often diametrically opposed personalities. For one, in the series’ typical refusal to adhere to gender stereotypes, all of the negotiations in this episode are handled by very canny women. The women from Moya’s crew refuse to let themselves be intimidated by the sellers of the device they need and prove just as good at playing hardball as any man–and that even includes Noranti, particularly impressive since dotty old women are often thought of as the least shrewd and most easily conned people when it comes to these sorts of business deals–while, on the villains’ side, the fate of countless planets rests on the negotiations between two fierce female military leaders. As the plot proceeds, Aeryn and Sikozou work together for what is possibly the first time, and do it well, genuinely collaborating rather than squabbling. Meanwhile, Chiana and Noranti have even more fun, thanks to a temporary genetic manipulation procedure that allows them both to look like they’re from different species for a brief time, in order to stay hidden from the PKs. The best scene occurs when Braca nearly recognizes Chiana, but she brushes him off, posing as one half of an affluent and rather eccentric lesbian couple with Noranti, the capper being her playfully love-biting Noranti’s ear, as an indication that she did well. In short, it’s a complete blast, with lots of great comedic chemistry, as well as fun twists and turns for all of the characters. It’s particularly satisfying to see Aeryn turn the tables on Grazya and take her into her custody, even if she does manage to ultimately elude capture, or so it seems. The characters later assume that the Grazya and Braca who escape are actually bioloid replicas–carbon-copy robots, as we learn Sikozou is, as well–leaving the Scarrans free to torture the information out of the real ones at their leisure, but it seems from later episodes that they are actually wrong about this and it is, indeed, the real ones who escaped. What is undoubtedly true, though, is the fact that they did manage to capture and replace Aeryn. When everyone is finally back on board Moya, they are distressed to discover that the Scarran dreadnought is able to zero in on their location, despite a starburst jump. As it turns out, someone is broadcasting a signal from inside Moya, and that answer turns out to be Aeryn, who John is horrified to realize isn’t Aeryn when she doesn’t only not know what he’s talking about when he refers to the baby but finds herself incapable of even saying the word. It clearly hadn’t been programmed into her vocabulary. An earlier sign is also how willing she is to point the blame at Sikozou, after they’d worked so well together throughout the episode. And so, just as John had feared, an enemy–but the Scarrans rather than Scorpy or the PKs–had captured Aeryn in order to get to him and the wormhole knowledge in his head. The idea of Aeryn needing to be rescued hearkens back to the foreshadowing of “John Quixote”–in retrospect, a crucial episode that foretells the rest of the season in microcosm–when John had to save the “princess,” and the false, bioloid version parallels the false Chiana from the videogame. Basically, John’s worst nightmares are lived out here. He has to shoot and kill something that looks exactly like the woman he loves, and he has no idea how he’s ever going to get her back, now that she’s in the hands of a fearsome enemy that makes the Peacekeepers seem unthreatening by comparison.